A daylong outing with Canoe Escape in central Florida offers a natural and relaxing experience very close to Tampa and Busch Gardens, but opposite in tone and experience. This is the wild Florida, the real Florida, the Florida before theme parks and housing developments, and I’ve never seen a more stirringly beautiful Florida. It took a couple of years to convince my family (and a full hour to extract our 11-year old out from the hotel), because wild, real and water in Florida means you will be up close with alligators whose habitat this is. But with a bit of cajoling and imagining we were native Floridians (who think nothing of sharing the waterways with these reptiles), I was able to get everybody over to Canoe Escape (813/986-2067) in Thonotosassa, just 16 miles from downtown Tampa. It proved to be the highlight of an amazingly wonderful visit to Tampa, which surprised us with its diverse and fascinating family-friendly attractions, from the incomparable Museum of Science & Industry to Busch Gardens theme park, notable for being both entertaining and interesting with a African village motif. Canoe Escape may sound like a theme park ride, but “escape” is apt: from the moment you push off from the bank and enter the magnificent and gentle Hillsborough River, beneath a canopy of great cypress trees and oak, you feel you have escaped the pressures and worries of modern life. You may as well have been transported 100 years back in time. I don’t recall ever being so serene and so excited at the same time. Joe Faulk, the owner who started Canoe Escape over a decade ago after a career in hotel management, personally guided us down the river. Joe Faulk has almost single handedly created a canoe destination out of Tampa which out-of-towners could enjoy (65% of his business are visitors), dividing the river into trips that can be done in 2 ½-3 hours time utilizing the Hillsborough County’s park system, so there are lavatories, phones (to summon the bus back for a pick up) and parking spots at the beginning and end of each segment. He, along with his son Brian and wife, Jean, run an outstanding, and efficient operation–you feel cared for, looked after, even if you go out on your own. The trip segments, which each range from 4 to 6 miles in length, can be easily self-guided. Canoe Escape provides a handy map and excellent directions; what is more, it is hard to get lost since there is only one river, you flow downstream, and you will soon realize if you have inadvertently taken a tributary. You also can arrange for a guided tour. What I like best is that the outfitter didn’t just dump you at the launch; their trip notes are very complete and address even the obvious (do not feed alligators; no dogs–“we love em but so do gators”; bring all trash back, etc.). Other “no-no’s”: glass, styrofoam, firearms, chainsaws, loud music. 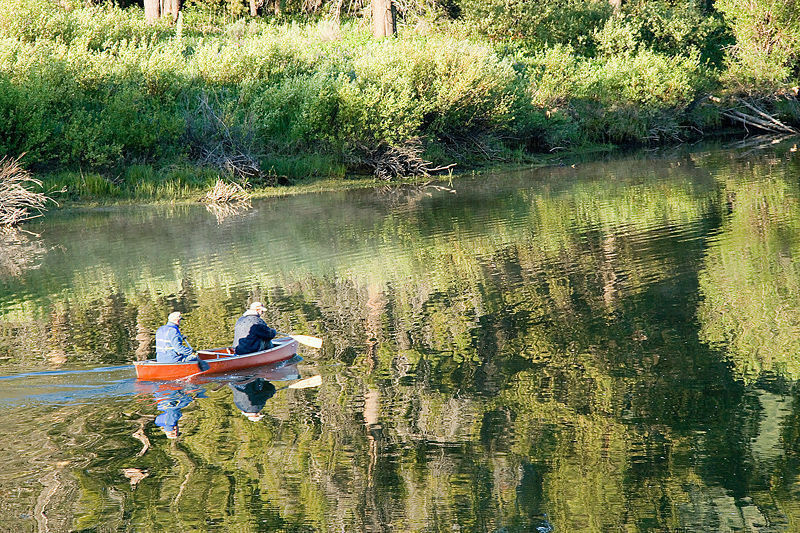 The 4½-mile segment of the river we take, which Canoe Escape calls Trip 1, is the most popular, especially if you only have time for one segment, because of the abundance of wildlife. 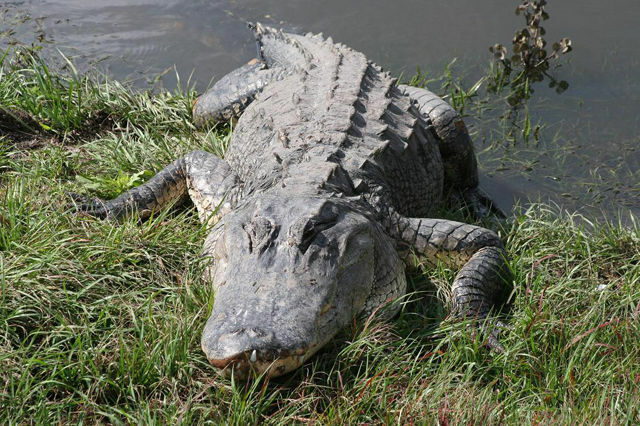 It is the best area to see alligators in the wild; it is also the trip recommended for first-time paddlers of any age (even infants or a child of any age who is able to sit still for two hours can take this trip), birders and photographers. The canoes are outfitted to maximize comfort with a clip-on backrest (purists would likely prefer to sit on their knees). The canoe experience proves superb for our three-generational outing; even Grandpa, who was just as reticent as our 11-year old in the prospect of canoeing, soon is caught under the spell of the river. A short distance from where we set out, in Sargeant Park (their new base camp), we make a right hand turn to enter Flint Creek where Joe knows we are likely to see the biggest collection of alligators we would see that day. We are fascinated and even our 11-year old quickly overcomes the main fear of the river–the alligators. They simply laze on the bank, on logs, or slowly ease themselves into the water. We figure there may be big ones, and plenty of them, below the surface, but we feel very comfortable, and are soon entranced by the beauty of the forest, the river, and the profusion of birds. 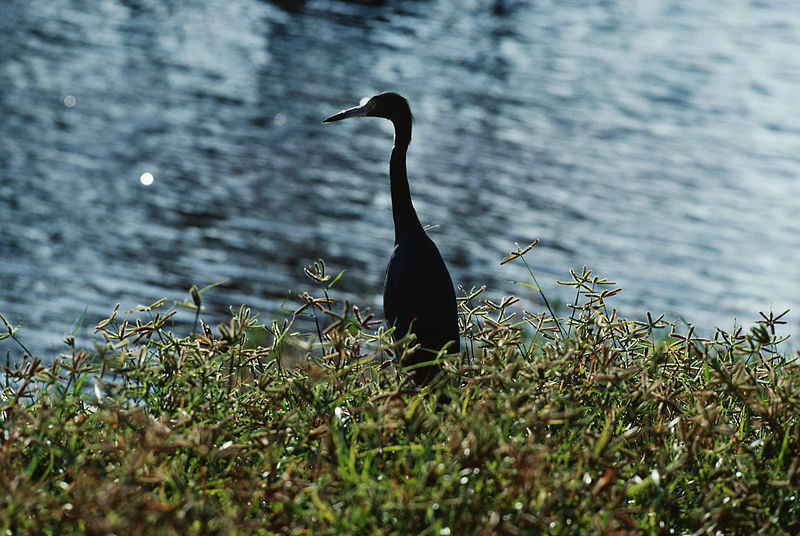 Just near the alligator, a great blue heron is poised on a log; an anhinga is drying his wings in the sun, a great egret is higher in the tree, and there is a black crown night heron. Florida red-bellied turtles and Peninsula cooter cluster on logs. Even though he has no official role, it is clear Faulk feels himself a steward, a protector, of these precious resources. He remarks that they only prune back fallen trees when they become impassable; as a result, you have to duck down or ease through in many sections. During our trip, Joe explained that because of the drought caused by El Niña, the river, normally two feet higher, was at the lowest level he could recall–3 to 3½ feet deep, and even down to barely a foot deep in some spots, exposing more logs and rocks than usual, and requiring more finesse in maneuvering. The lack of water impacted on the number of birds–he said it is more typical to see 20 to 30 of a species rather than just a few; even so, we were delighted by the sheer variety of birds we spotted during the course of our trip. The Hillsborough River, flowing 54 miles from Green Swamp, just outside Disney World to Tampa Bay, is a blackwater river, in parts the color of tea, caused by the tannic and humic acids that are added to it as it flows through acidic flatwoods and swamps. The river provides 75% of Tampa’s drinking water — 65 million gallons a day. This 23-mile stretch of the river is part of a 16,000-acre protected wilderness, so very soon, you are deep in the forest. The peace of the place is palpable–no sound of cars, trucks, stereos, just the splish-splash as the canoe paddle as it enters and strokes the water, the shrill cries of the birds, and rustle of the breeze. The pure air is heavenly. You lose all sense of time. A great egret sails above, coming very close to our 15-year old and my mother. We spot him again, on the bank, with a fish in his mouth. Others on the river that day saw wild hogs (thought to be descended from the ones brought by DeSoto on his explorations), deer and a brown water snake (nonpoisonous but I didn’t mind missing that one). I keep searching for the river otter that can be found here but they elude me. Depending upon the season, you may also get to see roseatte spoonbill, wood stork, pied-billed grebe, prothonotary warbler, blue-gray gnatcatcher, American robin, wild turkey, great horned owl, yellow-crowned night heron, bald eagle, river otter, raccoon and wood duck, and the Florida banded water snake (also nonpoisonous). Out-of-towners like us tend to come midweek and that is a good idea. Weekends, the Tampans come out in throngs, but even when there are 70 canoes on the river, you are not likely to see many. There are six total trip segments to disperse people even more and preserve the tranquil experience. Faulk also spreads people out by taking reservations. And, instead of filling up a busload before heading out to the river, Canoe Escape will head out with just two or three canoes. There are presently several different self-guided day-trip combinations. You are encouraged to take extra time so you can feel wonderfully free to explore a tributary for birds, picnic, shoot pictures, or even go fishing (a license is required). Canoe Escape offers canoe trips year-round (except for Christmas Eve, Christmas Day and Thanksgiving), operating from 9am weekdays and 8am on weekends (latest launch for a two-hour trip is 2pm; noon for a four-hour trip and 10am for the six-hour, and the last pickup is at 5pm) A scheduled interpretive guided trip is offered every Wednesday at 11:30am. Weather is not likely a problem–Tampa’s weather is temperate, semi-tropical with an average winter temperature of 62.5° F and an average summer temperature of 81.4° F; in the rainy season, Tampa tends to get showers in the afternoon, so you can canoe in the morning. Moonlight trips are offered October-April, usually once a month on the Saturday closest to the full moon, finishing with coffee and dessert at a local restaurant. Bring a flashlight to illuminate the male gators’ eyes (the males have a red pigment). These trips are $70 per couple (no kids on this one! ), and reservations are required. The Canoe Escape website is extremely helpful providing handy lists of what to bring and what you are likely to see (even with pictures), and a printable list you can take with you to check off as you go. There is even a whole page devoted to alligators (we are obviously not the only ones who saw this as a deterrent). 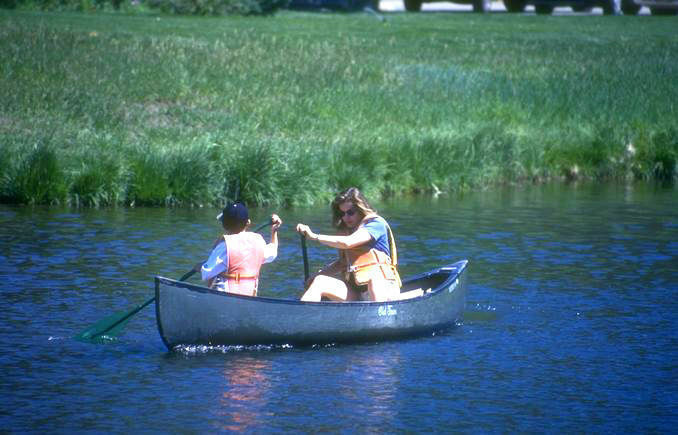 The service-oriented aspect of the Canoe Escape operation is apparent even in its retail shop–in fact, if you forgot anything, you are likely to be able to purchase a quality-made item (t-shirt, windbreaker, hat, sunglasses, water-proof one-shot camera, sunscreen) at a moderate price right at the shop. For information about other canoe outfitters throughout the state of Florida, visit Paddle FLA USA, the website of the Florida Professional Paddlesports Association. For further information about Greater Tampa, call Tampa/Hillsborough Convention & Visitors Association, 400 N. Tampa Street, suite 1010, Tampa, FL 33602, phone 813/223-1111.